I am not only super excited to share another dress that I made, but I am also so excited to share this dress in particular since I just love the print. For those of you who don’t know, I am Australian and I am actually from the Gold Coast, but currently live in Melbourne and the thing is, I absolutely love the cold and rain. I always say I should have been from England since I love vintage things, tea, chips, cold, rain and so much more from that country; so when I saw this fabric, I knew I had to get it. 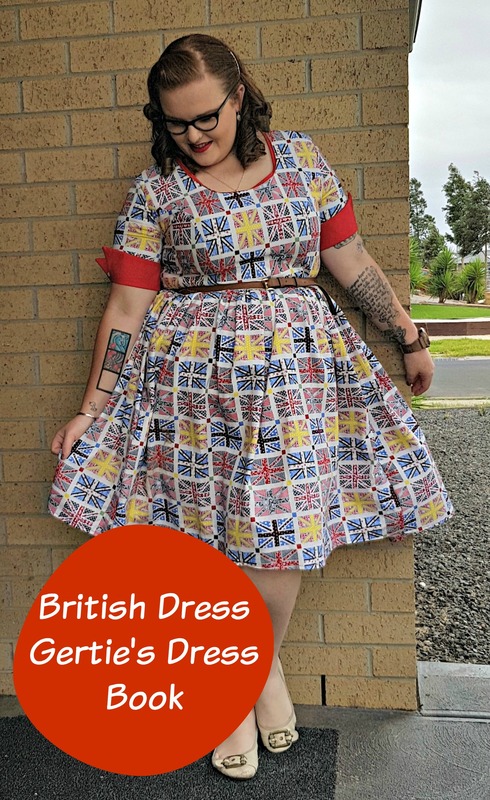 For this dress, I used a few different pattern pieces from my Gertie’s Ultimate Dress Book which I was lucky enough to get for Christmas from my Mother in Law. I was looking through the book and there were so many dresses that really caught my eye including the ‘Blue Wool Work Dress’ which had these amazing shirt cuffs on the dress. I also really liked the dresses with a Princess cut bodice, which is a style new to me, but that I am falling in love with. I also wanted to attempt some bias binding around the neckline as I have never done it before and on top of that, I don’t really like dealing with facing moving around when I wear my dresses. The one thing I have noticed from the Gertie book that I absolutely love is the fact that all of the pieces seem to go together. Although she has given tons of ideas in the book, you can mix and match the patterns yourself to create a completely different dress each time, whilst still using the one book. I also find her instructions and patterns to be extremely easy, which is great because I am still new to making bodices and dresses. When it came to fabric, I was just so in love with this Union Jack print. Not only is the flag a country that I love, but I also love how all the flags have their own pattern on it which is so cute and vintage. I believe that the fabric is just a basic printed cotton and it very lightweight without being too thin, which is nice. For the cuff and bias binding, I decided to use a red accent colour, since red is one of my favourite colours; for that fabric, I just used a cheap poplin. When it came to the construction of this dress, I found it to be pretty easy. All I have to do was construct the bodice which consisted of seven pieces, but they all fit together very well. I then did my bias binding around the neckline; to be honest, it is not perfect, but for my first attempt, it is definitely good enough to wear. I then constructed the sleeves, which included this beautiful cuff; to make the cuff stand up, I used a fusible interfacing to make the fabric stiffer. I then added my skirt on, which I just used my normal gathered skirt technique. For all of my gathered skirts, I cut my fabric 28inches long, which is a good length for my height. I then sew my skirt together along the 28-inch seam and during this process, I also added pockets. From there, I now had a skirt the right length, but extremely wide; so I used my overlocker/serger to gather my skirt. I do this by leaving my threads that wrap around the edge on my normal setting and making the thread that sews straight extremely tight (the tightest setting) and making my stitch length as long as possible. When it came to a fitting and the final product. I am extremely happy with the overall result. The sleeves are a little tight and the waistline is a little big, but other than that, I am so happy. I really like the way this dress looks and I have a feeling you guys will be seeing me wear this a lot. I hope you guys enjoy my sewing posts. I love to sew and I love to make beautiful vintage clothes. I love using quirky fabric and it makes me so happy to strut my stuff using something I made with my own hands. Disclaimer: I paid for all of these products myself and am not being paid to include this pattern. All opinions are 100% my own. I love this dress and you look absolutely gorgeous! You are so talented! And those cuffs on the sleeves are to die for! I love seeing your creations. Also, I really must learn to sew!